I was surprised to find so many places I wanted to go in Portugal when I started researching my trip. Everything looked so amazing I had a hard time deciding where I wanted to go. In the end, I decided to do a Portugal road trip so that I would be able to see as much of the country as possible. It wasn’t easy to fit it all in the time that we had. I thought it would be helpful if I shared some tips I learned along with our Portugal road trip itinerary. For more tips on getting ready for your road trip, check out my Road Trip Packing List and Preparation Guide. I was slightly apprehensive about doing a road trip in a foreign country. In preparation for our Portugal road trip, I got my international drivers license. I just wasn’t sure what the roads would be like and if I would have issues understanding any Portuguese road signs, but driving in Portugal was much easier than I expected. In Portugal, you drive on the right side of the road. Since I am used to that and being from England, Russell is not, I would be the driver and Russell would navigate. That arrangement worked out well. We found plenty of places to stop along the way, so our Portugal travel itinerary would not include many long stretches of driving. The Portugal roads were actually much better than in the US. Most highways I drove on were two lanes each way. The roads were smooth and never too crowded. Slower drivers politely kept to the right. My only frustration was there are a lot of roundabouts. Some roundabouts were stressful but luckily most were not crowded so it was not too bad. Some of the roads did charge a toll. We got a Via Verde device in our rental car so we could go through the fast lane on the Portugal toll roads and it would get automatically billed to my credit card. If you plan on driving, be sure to get the Via Verde pass as some of the toll roads in Portugal only accept electronic methods of payment. The roads in Portugal were much better than I expected. We had a total of 8 days to spend and we wanted to see as much of Portugal by car as possible. Looking back, it was a good introduction to Portugal but was definitely not enough time. I loved all the places that we visited and hope to make it back to Portugal to see some of the spots we missed. I should also mention that, if you plan a trip to Portugal, you do not need a car for Lisbon or Sintra. While driving in Lisbon was easy, I am not sure how easy it would be to park there. We picked up the car after we visited Lisbon and Sintra. You don’t need a car in Porto either. 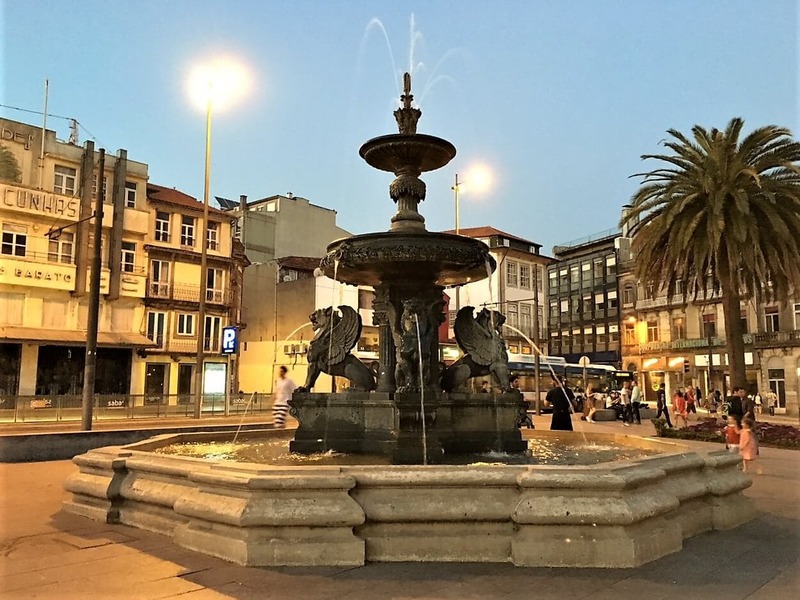 Driving in Porto was actually pretty stressful with the narrow roads, traffic, and lots of construction; however, you would miss the stops between Lisbon and Porto if you just took a bus or train. Get a printable version of our Portugal itinerary to help you plan your road trip. Our flight was late landing in Lisbon so we lost a few precious hours there. It’s a beautiful city, Lisbon has lots of instagramable spots and plenty to see. The public transportation here is great so you won’t need your car. 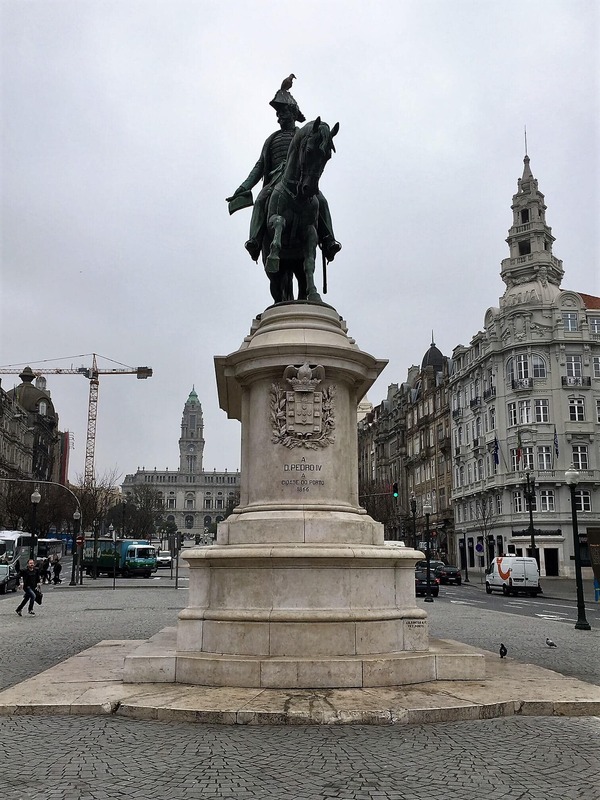 With limited time, we mostly explored Belem and Alfama. My favorite spot in Lisbon was St. Jorge’s Castle. I loved walking around the ruins, seeing the artifacts, and then taking in the sunset with a lovely view of the city. More on St. Jorge’s Castle coming up on the blog. You could also spend some time in Cascais exploring the old town and relaxing on the beaches. 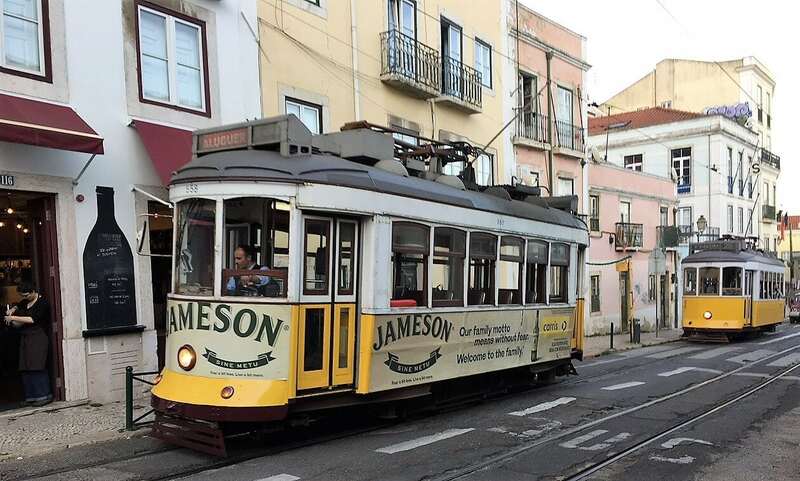 Also, check out these practical tips for visiting Lisbon. Sintra is a resort town full of castles and palaces in the foothills of Portugal’s Sintra Mountains, about an hour train ride from Lisbon. We did our own one day tour of Sintra. 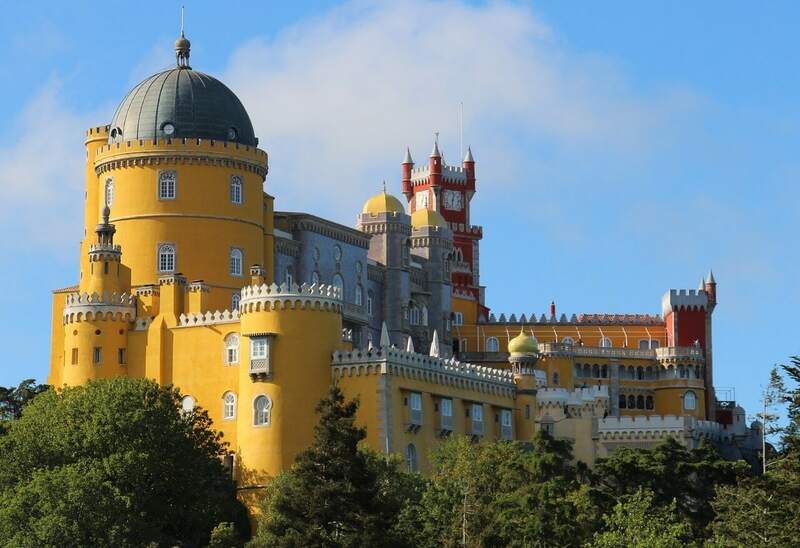 We took the train from Lisbon and visited the Castle of the Moors, Pena Palace, and the National Palace of Sintra. I loved all the castles we saw, but I think the Moorish Castle was my favorite. Then we took the train back to Lisbon for dinner. I would have liked to see more of Sintra but seeing three castles made for a pretty full day. We picked up the rental car at the airport so that on the way back we could drop off the car and be ready for our flight home. The Lisbon to Porto drive should take about three hours. We wanted to take our time and make a few stops. Our first stop was Obidos, a well-preserved medieval town with a castle not too far from Lisbon. It is a picturesque place and we loved doing the city wall walk. Then we stopped for lunch at a beach town called Nazare. I was hoping to see the giant waves but it all went terribly wrong. We saw a beautiful restaurant on the beach with floor to ceiling windows. The views were lovely but after waiting an hour for sandwiches – with no explanation – we just gave up. We decided to go to another place and grab some pizza. We didn’t see the huge waves either because I didn’t realize the season to see them between October and February and we were there in April. I could see the appeal though. It was a beautiful, wide sandy beach that would be wonderful in summer or during the big wave season. A view over Obidos from the city wall walk. We made one more stop on our Lisbon to Porto road trip in Coimbra. The city is located on the banks of the Mondego River and was much bigger than I expected. Coimbra is known as home to one of Europe’s oldest universities, dating back to the 16th century, which is a key part of the town. We drove through the town and just made a quick bathroom stop and grabbed some natas. Maybe next time, we can see the Joanine library at the University which is supposed to be a bibliophile’s paradise. Porto has a reputation as a beautiful city and well worth a visit. I`d say that doesn`t do it justice! The old town area is gorgeous and atmospheric and the people were friendly. I had a great time. 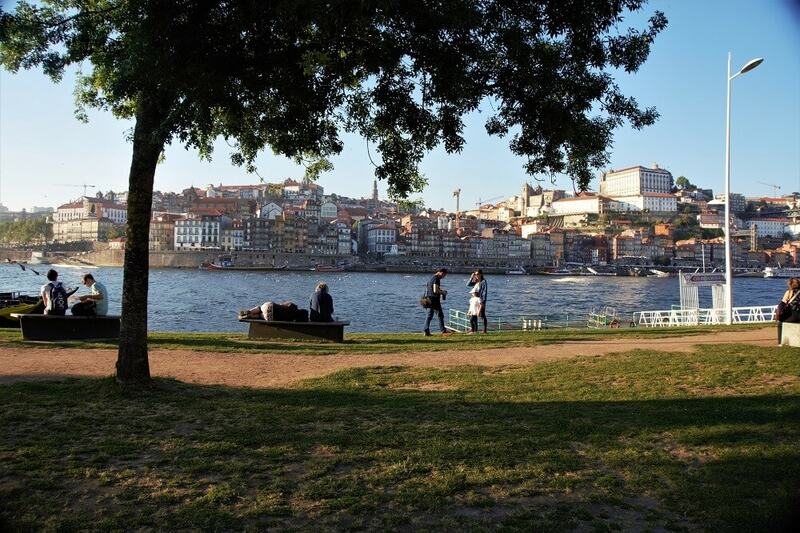 It would have been nice to spend three days in Porto and see more of the city. Our first night we went for a dinner and fado show. Fado is traditional Portuguese music known for being expressive and melancholic. While the music was mostly in Portuguese, the lead singer took time to explain what each song was about in English and a few other languages as well. We also did a food tour, visited some port houses, and sought out the Harry Potter spots while we were in Porto. 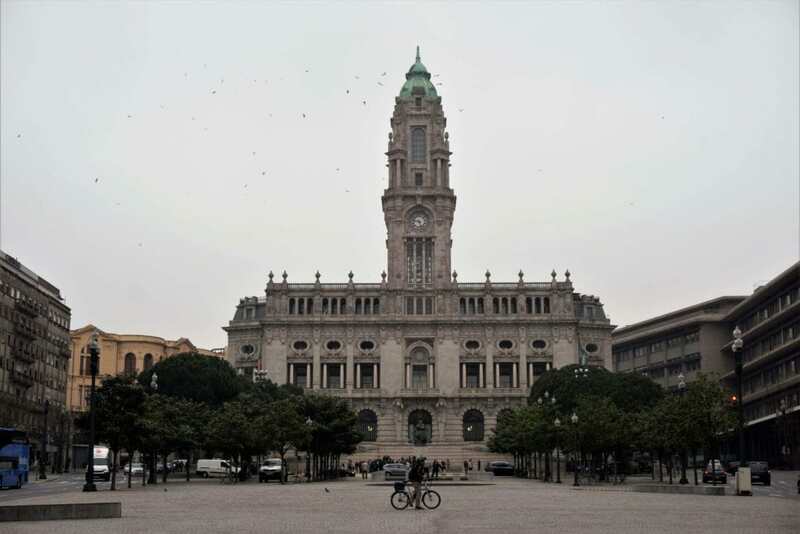 If you are looking for a hotel in Porto, we were guests of the Porto Grande Hotel and we really enjoyed our stay there. It is a beautiful, historic hotel that is conveniently located in the center of the Old Town area. Click here to check price and availability for the Porto Grande Hotel or Click here to read TripAdvisor reviews. After a delicious breakfast at the Porto Grande Hotel, we headed south to the Algarve. The total drive time was six hours and we wanted to make sure we made it in time to catch the sunset on the beach. 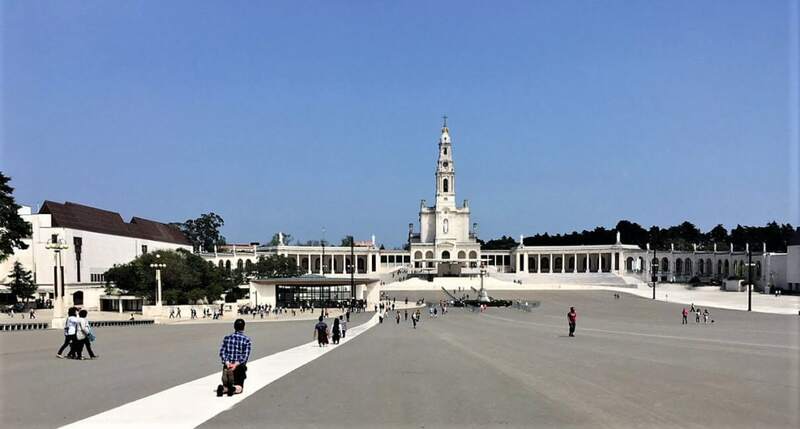 We stopped in Fatima, a fascinating town that has become a pilgrimage site thanks to three children who saw a vision of the Virgin Mary. There is a lot to see in Fatima, so you probably want to allocate a few hours. There are two basilicas and a shrine, built at the site of the Marian apparitions. You can also visit the houses the three children had lived. When we were there, they were getting ready for a visit from the Pope to mark the 100th anniversary of the children’s visions. Whether you are religious or not, watching the pilgrims making their way to the main basilica on their knees in prayer is a humbling sight. The beach in Salema in the Algarve. 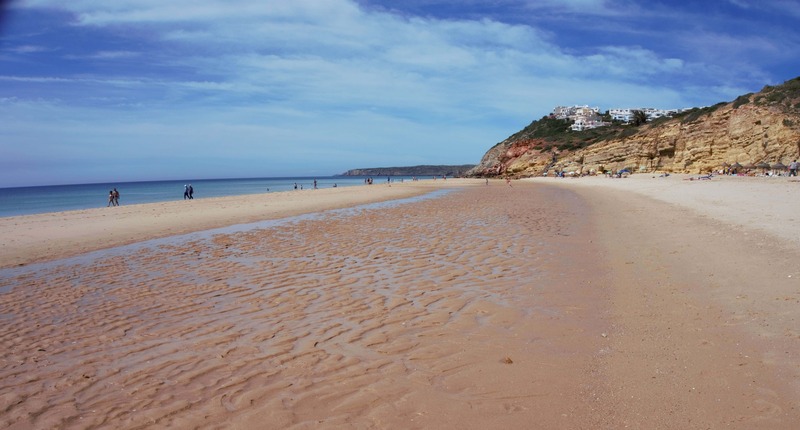 On Day 7, we did a mini Algarve road trip so that we could visit a few of the little fishing towns and beaches. We were staying in Albufeira, so started the day by driving in the Algarve to Sagres, which is the most western point in Europe. After taking in the view, we went to Salema, another small town in the Algarve, walked on the beach and had a nice lunch. After lunch, it was time to head to Lagos for our boat trip to see the Algarve caves. Then we walked around Lagos for a little bit and headed back towards our hotel. We decided to have dinner at Restaurante Bar Praia Da Galé because it was supposed to be a nice place to watch the sunset. It did not disappoint, the food was excellent and we enjoyed the views. I think it was my favorite meal of our whole trip! The drive back to Lisbon was a little more than two hours, but we wanted to make sure that we made it back in plenty of time for our flight. 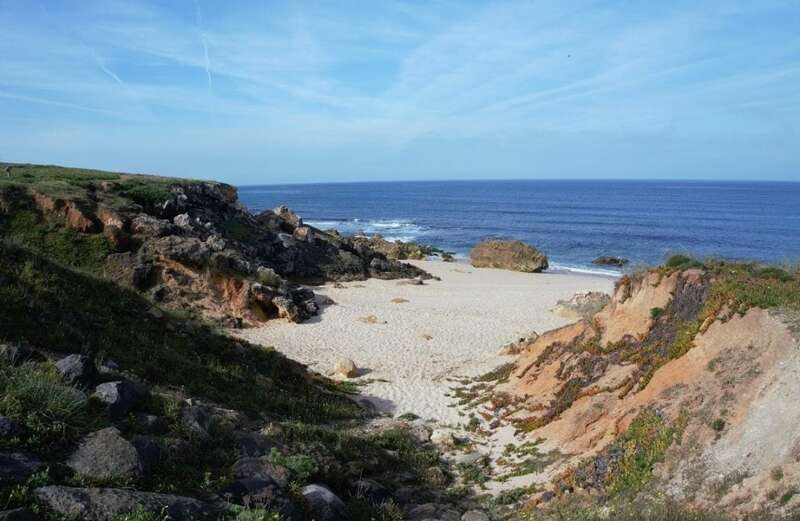 We decided to take the scenic route and drive along the Southwest Alentejo and Vicentine Coast Natural Park. We stopped to take a few pictures along the way but didn’t really do much sightseeing. Most of this drive was one lane each way and I did get stuck behind a couple of slow trucks. The Algarve coast is so scenic! Even with everything we jammed into our weeklong Portugal itinerary, there were still a few things that we didn’t have time for. I don’t think there is anything that I would have skipped (well maybe the restaurant in Nazare) on our trip though, so I think the only option would have been to add a few more days. I really would have liked to see more of the sights in Sintra like Monserrate Palace, the Chalet and Garden of the Countess of Edla, and the Palace of Seteais. We were only able to allocate one day there. I could have easily done with another day. 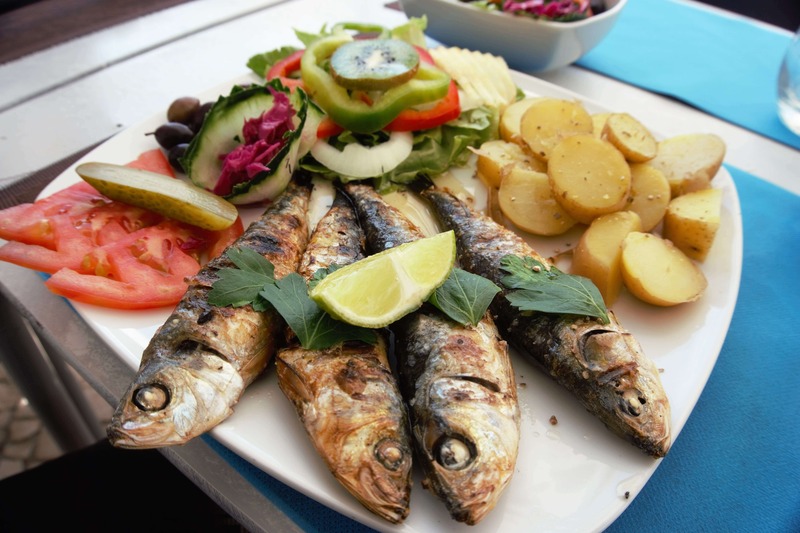 The food in Portugal (and especially the Algarve) was delicious! I really love the sardines. The Douro Valley is the most famous wine region in Portugal and from the photos, I have seen, it is just stunning. Since I enjoy the Portuguese wine (and wine in general! ), I wanted to do a day tour of the Douro Valley. With the way our Portugal road trip itinerary worked out, I had to choose between the Douro Valley and Porto. I decided I would come back to spend a weekend in Porto and see the Douro Valley. If you are looking for a tour of the Douro Valley, check out these options on Viator. I was really impressed with the natural beauty and relaxed atmosphere in the Algarve. Honestly, I could have spent a whole week just in this area exploring more of the best places in the Algarve and never been bored. We didn’t have time to visit any of the towns closer to Faro like Olhao. Factor in the beautiful beaches and that would be a week well spent. 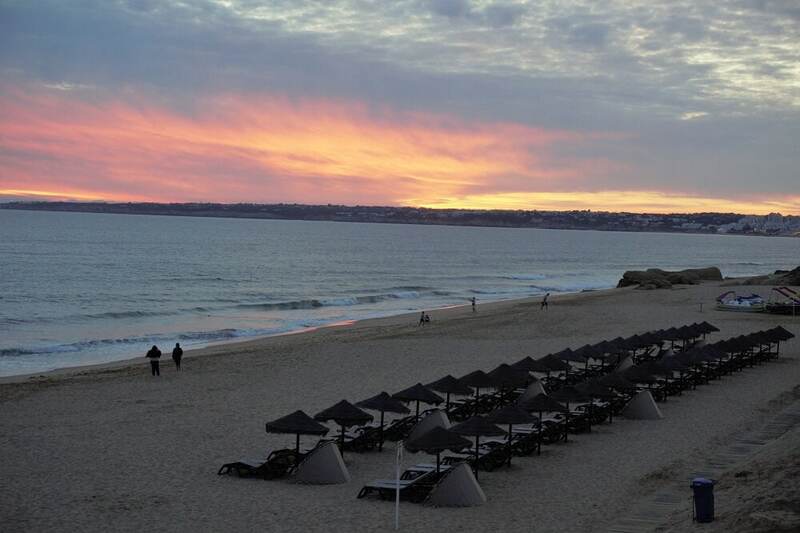 It might be even nicer to visit the Algarve in the winter when it is even quieter. Update: We went back to the Algarve in January 2019 to explore more. During our short visit, we went on a wine tour and did the Seven Hanging Valleys hike. We stayed in Armacao de Pera at the Holiday Inn. For more details on the property, check out my comprehensive review of the Holiday Inn Algarve or Tripadvisor. Aveiro is also known as the Venice of Portugal because of its canals. It’s a great place to explore by foot with its small bridges and beautiful beaches. The Cathedral of Aveiro is also supposed to be beautiful. Aveiro is located between Coimbra and Porto. Évora is another well preserved medieval town located directly east of Lisbon. 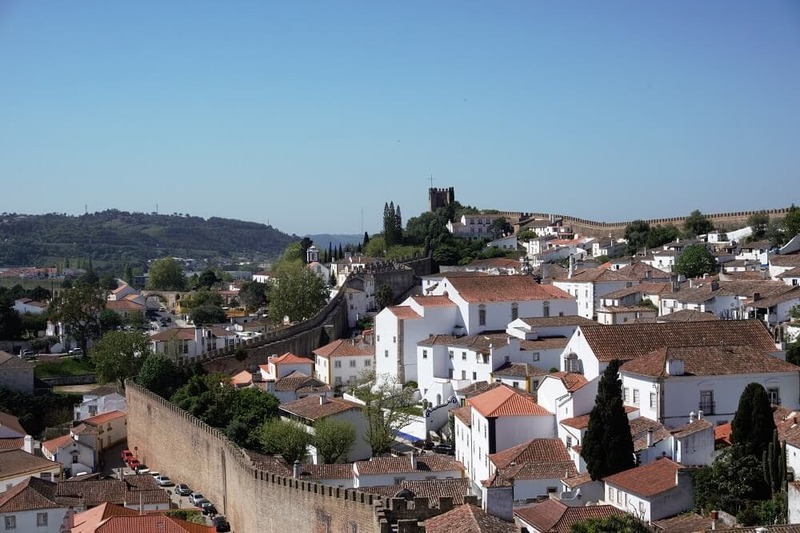 In addition to the original city walls, you can see 14th – 17th century palaces and the remains of the Roman Temple of Evora from the 1st century. The picturesque streets are lined with the traditional red roofs and white washed houses and lots of trees. Actually, there are several towns worth a visit in the Alentejo region. Guimarães is a UNESCO World Heritage site located northeast of Porto. It has a mix of architectural styles from the middle ages to modern. You can also visit one of Portugal’s most impressive castles – Guimarães castle. If you can only afford 4 days for your trip to Portugal, I would recommend 2 days in Lisbon and 2 days in Sintra. You would not need to rent a car. While you are in Lisbon, be sure to see the sites in Belem. You will definitely want to come back and spend more time exploring the rest of Portugal. There is a lot to see in Portugal and a lot of attractions to cover. We weren’t able to fit it all in during our 8 days. If you only have 7 days in Portugal and want to see the major sites, then consider flying into and out of different airports. You could fly into Porto and fly home from Faro in the Algarve or vice versa. I was tempted to do our Portugal trip that way but it was significantly more expensive. In addition to flight cost, you need to see if the rental car company will charge more for returning the car to a different location. Check out booking.com to find the best deals for accommodations for your road trip in Portugal. You could also very easily just spend one week in Portugal based in either Lisbon, Porto, or the Algarve and do a few day trips. 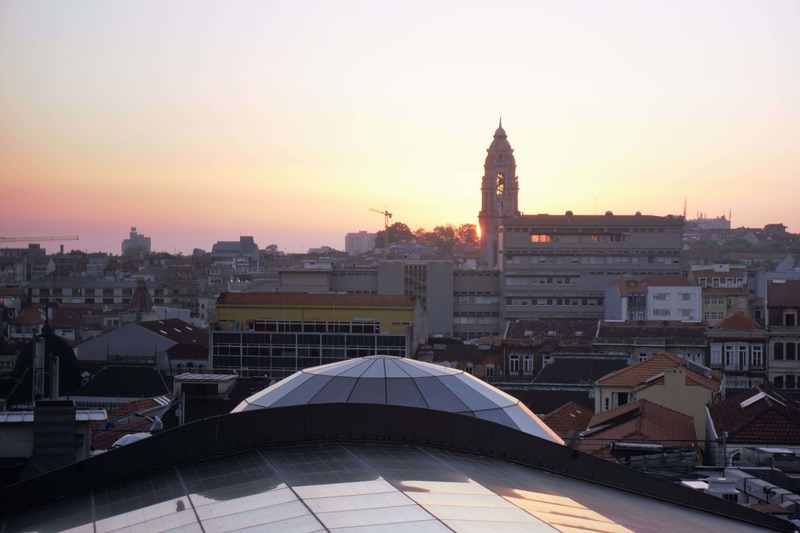 (Check out this guide to help you decide between Lisbon or Porto). Granted you wouldn’t be able to see as much of the country but it might be a more relaxed Portugal vacation itinerary. I would have loved to have a few more days in Portugal. If you have 10 days in Portugal, I would recommend taking the itinerary that we did and adding a day in Porto (to go to the Douro Valley) and a day in Sintra. You could also spend the morning exploring the Algarve fishing villages and beaches before heading back to Lisbon depending on your flight time. Or maybe you would like to visit one of the Portuguese towns I mentioned above that I didn’t get to visit. You have lots of possibilities to fill a two week Portugal itinerary. If you are lucky enough to have two weeks in Portugal, I would follow my suggestions for the 10-day itinerary. 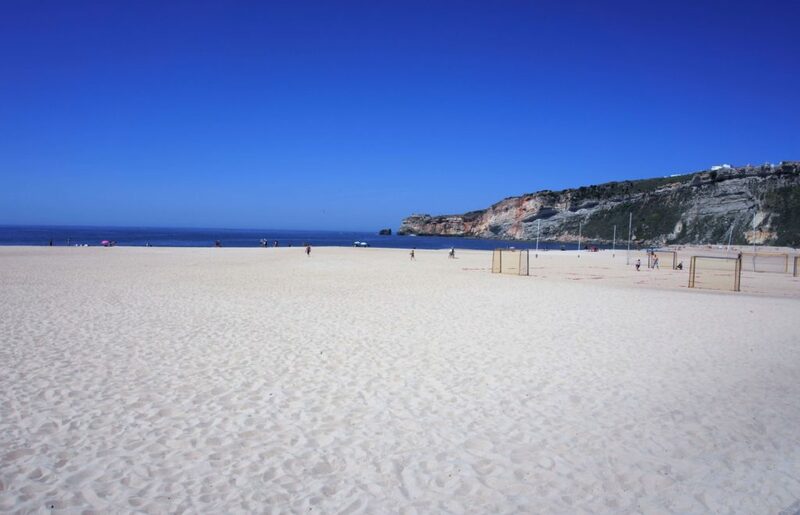 Then you could add two days in Lisbon (including one day trip to Évora), another day in Porto (maybe go to Guimarães or Aveiro), and then another day to relax at some of the gorgeous beaches in the Algarve. With 14 days, you can make good progress checking things off your Portugal bucket list. Watching the sunset over dinner was a great way to spend our last night in Portugal. Porto really has some impressive buildings. It was pretty easy to travel Portugal by car and we had a great time. Would you like to do a road trip in Portugal? What places would you include on your Portugal road trip itinerary? Check here to get your printable one page Portugal road trip planner. Driving in Portugal is similar to driving in the US, you just need to be prepared for the roundabouts and toll roads. Obidos, Coimbra, Nazare, and Fatima are all great options to stop and explore when you are driving from Porto to Lisbon (or vice versa). There is a lot to see in Portugal, you will need to prioritize to make the most of your time. You may also want to consider flying into one city and out of another to save time. You don’t need a car for Lisbon, Sintra, or Porto. However, I would recommend driving between Lisbon and Porto because there are several interesting towns to explore. Tanja – Glad to hear you liked Evora. I hope to make it there at some point. I think you would like Porto, it’s another pretty city. Great outline for an itinerary – haven’t been to Portugal yet but lots of great places on this list. The castles in Sintra look so colorful! Jessica – Thank you. I hope you make it to Portugal, I am sure you will love it! Oh… so many wonderful places to see in Portugal! I didn´t expect it either at the beginning. Marked this post for the future. I´ve only been to Lisbon and Sintra last year (haven´t seen all), and Porto 4 years ago. Algarve is still in plans. But I also want to drive around, cause this way you always get to see more. Your itinerary looks perfect! Anna – Thank you. Yes, you need to go back to Portugal. I do remember your Sintra post, it really made me want to go there! Great post, Portugal is on our list too. When we travel the Caribbean we adapt to the driving rules. To drive in Portugal, do you need an international driver’s licence? Dorothy – Thank you. Yes, you should get an international driver’s license. It is a pretty easy process which I plan to outline in a future blog post. Upeksha – Thanks! You will love it! Nicole – Glad to hear you enjoyed it too. I really want to go back and see more. Julie – So glad to hear that! Good luck on the flights, I know you will love Portugal. Thanks so much guys! So glad you enjoyed the post. I actually didn’t make it to Faro, hopefully will do on my next trip there. Vicky – Glad you enjoyed the post. I hope you get to visit Portugal soon. Kat – Thanks for the tip. Yes if I will try to spend more time in Coimbra. Annabel – Thank you. I can’t wait to go back either! Klaudia – Thank you, glad to hear you love Portugal too. Some really great tips for when we finally get to visit. I love that it’s do conducive to a road trip, as that’s how we prefer to travel. You fit a ton into eight days, but Douro would be hard to pass up for sure. Yvette – Thank you. I really do love road trips and we try to fit in as much as we can! Portugal is on my list of countries to visit too, Anisa. I would attempt to drive there however. Actually, I don’t think I would like to drive anywhere in Europe. It seems very crowded and very stressful. I’m lucky that my husband does all the driving when we travel, hahaha. Anda – With the exception of Porto, the roads in Portugal were not crowded at all. Ruth – Thanks that was the goal! I hope you get to visit Portugal soon. Hilary – Yes, there is just so much to see in Portugal, it is definitely worth a return trip. Thanks Ava. Yeah staying a bit outside Porto is a great idea. I didn’t have any issues with any of the other cities. When I backpacked around Europe I never made it to Portugal, I had no idea I had missed so much. It looks wonderful. Thanks Sally. I hope you get the chance to go back. Great you could see some not-so-touristic sites in your roadtrip, such as Coimbra. We managed to visit the university and the library was really impressive. The centre of Portugal (between Lisbon and Porto) has some unknown jewels. 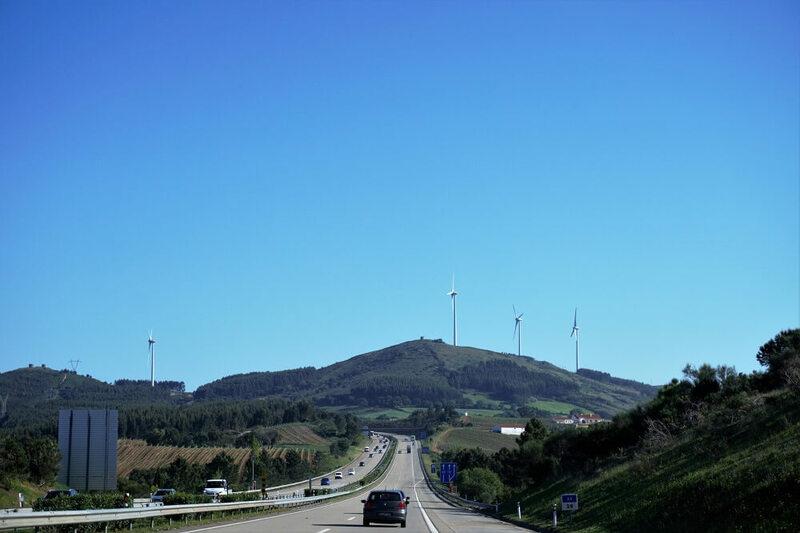 We spend some more days in Portugal and we drove from Lisbon towards the north (Porto) and then we left back to Barcelona, so we could see lots of hotspots during the journey. However we couldn’t visit Algarve (well, Dídac has been there but when he was a child!). Hope to visit those amazing beaches someday. Thanks for sharing! Thank you. I would love to see more of Portugal and I hope you get to visit the Algarve! Road trips are the best thing that you can do to stay refreshed in the life. Not only Portugal but every part of Europe is really interesting and you would be glad after visiting them. Loved being here and looking forward to visiting this article in the future! Sophia – I love road trips too. I would love to do more of them in Europe.